12.11.2017 VS BNTU-BelAZ Minsk Reg. 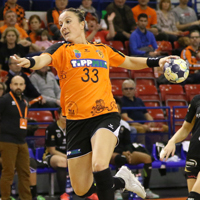 18.11.2017 - DAY REVIEW: The first seven teams are ready for the group phase of the Women's EHF Cup after the games in the third qualification round on Saturday. 17.11.2017 - ROUND PREVIEW: The 16 participants in the Women´s EHF Cup group phase are going to be found this weekend, as the second leg of the last qualification round is taking place.